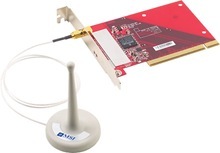 MSI's Wireless 11b PCI Card PC11B is a cost effective solution for desktop PC. It complies with IEEE 802.11b standard and provides 11 Mbps data rate. The PC11B enables any desktop PC to share a broadband connection, files and printers over the network without the time and expense of Ethernet cabling.